Nice weather brought out a crowd to the sledding hill. Recent snow reopened Hill 17 for sledding fun in Peninsula State Park. Photo by Len Villano. The last time I remember wearing snowpants was during spring break of my senior year at Gibraltar High School. Although it seemed as if most of the high school was fortunate enough to be taking actual spring-break trips to warmer climates, there were a few families – mine included – that always stayed in the county. This early in the month, the weather is always unpredictable, and my local spring breaks always featured snow. Instead of whining about not seeing or feeling the warmth of the sun, we had to make the most of what we were given; in my case, I was given snow and snowpants. The spring-break season for Door County schools begins March 11, with Gibraltar Area Schools on break first. The four other school districts have breaks later this month, when there’s a chance the weather may be a little warmer, a little sunnier. For all the local spring-breakers, I have four recommendations for making the most of an early-March staycation. It may seem obvious, but get outside. We actually live in a place whose natural beauty draws visitors from far and wide. As a student – or as a 9-to-5 working parent of a student – the time to enjoy the outdoors isn’t always available. During spring break, there’s ample time to explore the county. Some of my best spring-break memories are about flying down Hill 17 at Peninsula State Park with five of my closest friends. I’m not overly enthused about cold and snow, but once you’re decked out in cold-weather gear, you have no choice but to have fun. Oftentimes when getting home from sledding with my friends, I would later go out in my backyard with my brother and sister to sled some more. Sledding with my friends was a reminder of the fun I’d had when I was younger – at 18 years old, it was refreshing to feel like I was eight again. 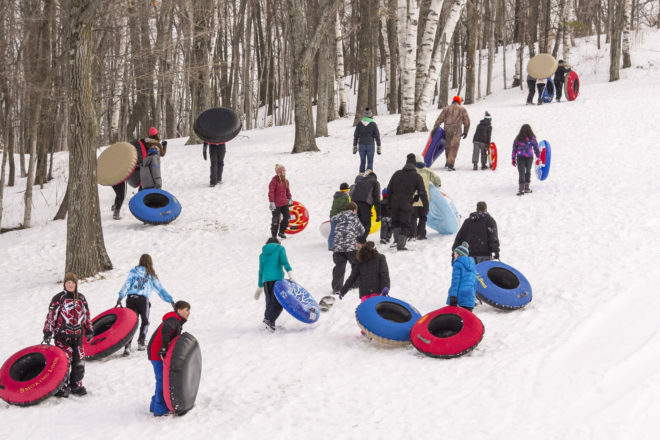 In addition to Hill 17, Winter Park in Kewaunee is another tubing and snowboarding destination, and if you visit there, you can even say you left the county during spring break. My second recommendation is to embrace a change of scenery. Just because you’re stuck in the county doesn’t mean you’re stuck in your home. If you have a little extra money, book a stay in a local hotel. Now’s a good time to try out some of our local accommodations because some offer midweek rates and waive the minimum-stay requirement at this time of year. Pick one that’s either right around the corner from where you live or at the opposite end of the peninsula. As long as it has a pool, it will feel a little bit more like a tropical vacation. One of the best parts of vacationing is that it forces you out of your familiar routine, and the good news is that you can experience this even without leaving the county. It’s easy during the work/school week to stick to a rigid routine – it’s how most parents keep everything on track – but creating variety can be as simple as changing where you go for your weekly fish fry. If you always eat at the same places on the same nights of the week, try something new to foster a refreshing break from the norm. If you like the restaurant, you might even have found a new favorite spot that you’ll be able to enjoy all year. My last recommendation is something that my friends and I often did during spring break: we went to the movies. Even though it seems like a mundane activity, it wasn’t a regular part of my life – as a student then or as a parent now. And Gibraltar students are in luck: Marvel’s next blockbuster, Captain Marvel, will be released March 8, just in time for their break. My friends and I would have been in line to see it because it’s the studio’s first film to feature a stand-alone female superhero. These are my four suggestions, but there are so many more ways to enjoy the county if you’re staying here for spring break. To increase your sense of rejuvenation, make sure they include some element of leaving your everyday routine behind. And know that the best part about staying in the county will be what happens at the end of spring break. I often hear people who’ve recently returned from a vacation say, “Now I just need a vacation from my vacation,” meaning that the process of traveling and having a full itinerary for an entire week left them exhausted. When you stay in the county instead, chances are you’ll actually feel refreshed at the end of the week. Any travel that you do will be minimal, and there’s no pressure to do anything on certain days. Sometimes there’s no better place to feel relaxed than at home.